Here is the reply given in an article by the editor of THE OJAI in 1897, under the heading, TO OUR VISITORS. 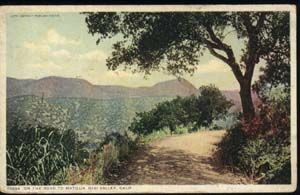 “One day, or an afternoon should be devoted to the Matilija, going by the hill road north of Nordhoff, digressing if possible to visit the Crawford place and get the eastward view from that point, and penetrating the canyon beyond Matilija to Wheeler’s or Cliff Glen. The hot springs of the Matilija are famous, but the rugged scenery is well worth seeing for its own sake. 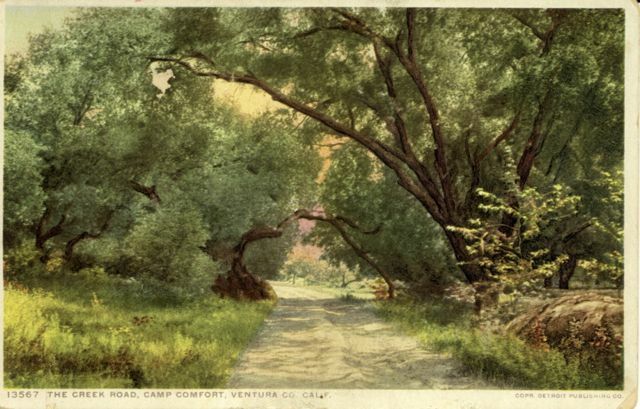 The return should be made by the Laguna on the Ventura road where the live oak vistas are finest. (Note: The Laguna, once also called Mirror Lake, is now dry, and lies immediately south of Henderson Field). If possible El Nido Ranch should be visited on the way. 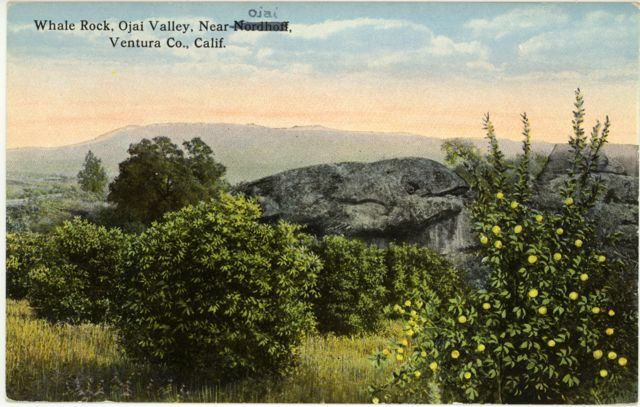 “Another drive should include the eastern end of the valley here the greater orange ranches are… One may proceed to Mr. Hall’s ranch where the oldest olive trees are to be seen and the celebrated Whale Rock, and to “Overlook,” Dr. Pierpont’s charming resort, and to Mr. Green’s where the first gold was found, and reach Mr. Thacher’s School at Casa de Piedra Ranch, most interesting to strangers perhaps at recess, from 10:20 to 11 a.m. A 1/2 mile north of Topa Topa Ranch of a hundred acres f citrus fruit whose reputation in the San Francisco markets is an enviable one. 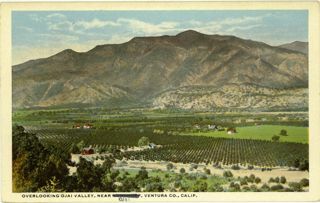 A little further drive will include Glencoe Ranch at the head of the valley, and the homeward trip will lead by “Old Nick’s” wine ranch and along the Ojai Avenue back to the town. “The Upper Valley” is worth another day’s excursion. Dennison’s stock ranch, Hobart’s well kept apricot and almond ranch, Robinson’s, Gray’s, McGuire’s, Pinkerton’s and others, and the large winery of Mr. Bracken are all interesting. The top of Sulphur Mountain may be reached from the upper Valley by comfortable road, and the view of the ocean and the islands amply repays the two or three miles of ascent. 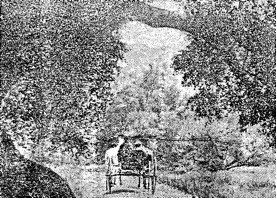 Horseback riding excursions were also popular for the local folk. There was some discussion whether girls should wear long divided skirts and ride astride their mounts, or ride side-saddle with their flowing skirts hiding pretty ankles. Side-saddles gradually disappeared, however, the chaperones being the last to give them up. Iâ€™ve got a short story to tell you about Mirror Lake (which is mentioned in the above story) that you might find amusing. In 1963, our family moved into the home my parents had built on South Rice Road in Mira Monte and only a short distance from Mirror Lake. This was during the summer when I was 12 years old. I had to have something to keep me busy, so I decided I was going to build a wooden raft to float on Mirror Lake. A couple of buddies (Doug Smelz and Rick Askam) joined me in the construction of that raft because they convinced me we should use their grandfatherâ€™s extra split-rail fencing as the main lumber. This natural pothole occupied the area south of Woodland Avenue and bordered on the east by the railroad which is now the â€œOjai Valley Trailâ€. If I recall correctly, I donâ€™t believe that the stretch of Woodland Avenue that runs from Highway 33 to Rice Road even existed. Weâ€™d hoof it over open fields, now covered with homes and a mobile-home park, from Rice Road to get to the lake. The lake was only about 6 â€“ 8 feet deep at itâ€™s deepest point. Weâ€™d get on the raft and use long poles to push off the bottom of the lake to move us around. Often times, when we were out rafting on the lake, the train would be chugging past. There wasnâ€™t much to the train. Seems like it usually only had an engine and one or two cars, and only two gents operating it. Sometimes, these two gents would stop next to Mirror Lake when they saw us out on our raft. Usually, it was in the middle of the day and around lunch time. The two gents would stand on one of their cars and talk to us while they peeled back the waxed-paper that wrapped their sandwiches. They never worried that theyâ€™d be in the way of another train becauseâ€¦â€¦â€¦â€¦â€¦there wasnâ€™t one! This is a great childhood memory of mine.